The noise and bustle on the streets of India’s biggest cities is a defining characteristic of a country that’s home to over a billion people. Every year, millions more leave their traditional homes in rural towns and villages and head into urban areas. The United Nations World Cities Report 2016 says 9.6 million people will move to New Delhi by 2030. To qualify as a megacity under the UN definition, an urban area must have a population of 10 million people. The UN takes into account urban sprawl and measures populations beyond official city limits. On these criteria, India currently has five megacities. Other urban areas in India are growing rapidly as people look to cities for jobs and financial security, as well as the chance of a better education for their children. This rural-to-urban migration will result in two more urban areas becoming megacities by 2030, says the UN. The UN’s World Cities report finds that big cities "create wealth, generate employment and drive human progress". On the downside, megacities are also responsible for driving climate change, inequality and exclusion, as well as the breakdown of traditional family structures, which leaves elderly people isolated and vulnerable. Many millions of people who move to India’s growing cities will miss out on the economic benefits of urban living. The UN report says the number of people living in slums across the developing world rose from 689 million to 880 million between 1990 and 2014. The Dharavi slum in Mumbai is home to an estimated one million people. New arrivals are not totally deprived of opportunities, however. According to the Economic Times of India, the slum has an economic output estimated at $1 billion a year. The drift from rural to urban living is not exclusive to India; it's happening across the developing world. 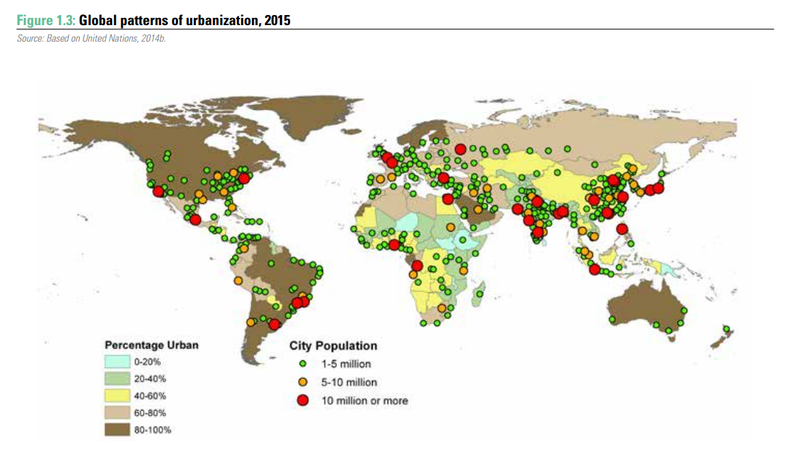 The UN report says 500 million people currently live in 31 megacities around the world. What's more, the number of cities with populations of more than 10 million people will rise to 41 by 2030. Most of that growth will happen in Asia and Africa. The two continents will be home to 33 of those 41 megacities by 2030.